Hanoi Luxury Hotel has just been opened in November 2008. It is one of the brand new, most beautiful and luxurious hotels in the center Hanoi. Hanoi Luxury Hotel has 8 floors with 38 cozy and comfortable rooms, accessed by an elevator and all rooms are spacious and well-furnished. 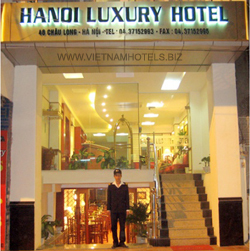 Hanoi Luxury Hotel offers you much more than a 3 star hotels. Inclusive: Buffet Breakfast, tea & coffee, fruits,Flowers, Internet in room. Please note: Price quoted are correct at the time of publishing but are subject to charge with out notice. Rate is for 2 people. No charge for one under 5-year-old child. Facilities: One Queen Size bed with lovely bath room with JACUJI and Beautiful city View.